When I think of Thanksgiving, I think of pumpkin pie! I tried spicing up my pumpkin pie this year by adding masala chai to my pumpkin pie filling. 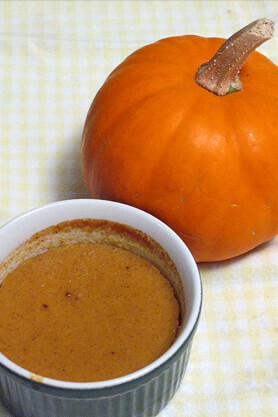 The result was a pumpkin custard that had a richer, deeper spice flavor, and a sugary sweet top. Terrific! I used this recipe to create pumpkin pie custard and served it in individual ramekins. But, the custard can be baked in one large dish or poured into your favorite pre-baked pie crust to create the perfect pumpkin pie. Mix the Masala Chai Black Tea and milk in a small bowl and place in the refrigerator for 24 hours or more. This is a cold brew technique to infuse the milk with the Masala Chai flavor. In a medium size bowl, beat together the eggs and sugar. Add the spices and salt and mix. Strain the milk through a small sieve to remove the Masala Chai Black Tea. Pour the strained milk into the bowl with the egg, sugar, and spice mixture. Add the pumpkin. Mix together until smooth. Pour the mixture into a medium size sauce pan and heat on the stove until it is hot to the touch. Do not boil. While the custard is heating on the stove. Prepare the ramekins. Spray 10 small ramekins with baking spray. Place the ramekins in a water bath. I placed the ramekins in two 9x13 cake pans and filled the cake pans with water. Make sure the water comes, at least, half way up the side of the ramekins. Top with whipped cream and serve warm or at room temperature.